The origination of the Barber Half Dollar closely parallels that of the Barber Dime and Quarter Dollar. The Mint hoped to obtain a new coinage design in 1890 by sponsoring a contest to replace the Seated Liberty theme. This failed when (1) financial terms could not be reached with the group of ten renowned artists first asked by the Mint to compete, and (2) all designs later submitted by the public were rejected. The task then fell to Mint Engraver Charles Barber. Barber coinage began circulating in 1892. The half dollar and quarter dollar share the same reverse, dominated by a large eagle and shield. The dime reverse features a wreath encircling the words "One Dime". The last of the Barber coins were released in 1916, though the final year of half dollar production was 1915. During the Barber coinage era of 1892-1916, the world saw revolutionary changes in transportation. 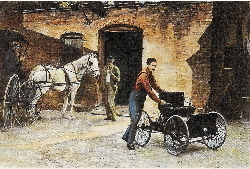 Henry Ford rolled out his first automobile in 1896 (above), which he called the Quadricycle. On July 20, 1903, the Ford Motor Company sold its first car, a Model A, to a Detroit physician for $850. Later in 1903, the Wright Brothers' flying machine took to the air under its own power, forever shattering mankind's obedience to gravity. 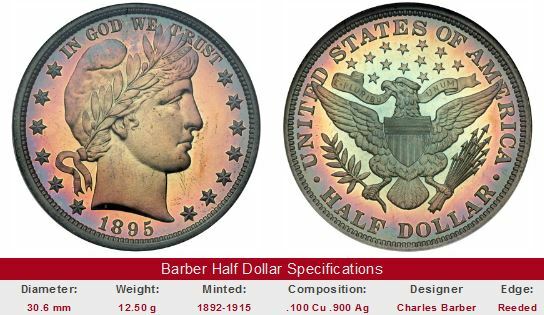 Don't look for any spectacular rarities in the Barber Half Dollar series, but there are definitely a few key dates having respectable records of value appreciation, all of which are still priced within the means of average collectors. Key date Barber Half Dollars are offered for sale below. Click the link to take you to eBay auction coins. As usual, its a good idea to purchase rare coins that have been certified by one of the leading grading services: PCGS, NGC, ANACS, or ICG. If the coins are "raw", then at least deal only with a seller of stellar reputation. You might be setting yourself up for a disappointment if you don't. The left hand side of each "Sales Box" is value trend data over a very long period of time for a coin of that date in Good-4 condition. The percent annual increase is computed for comparative purposes. The coin pictured for sale in the right hand side is not necessarily the same condition coin as that represented in the value trend analysis on left hand side.